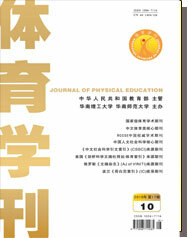 Abstract: By using the thought sampling method, the authors analyzed the characteristics of athlete mind wander-ing in resting and task states, and revealed the following findings: in a resting state, athlete mind wandering with meta-awareness is more often than mind wandering without meta-awareness, the contents are mostly scenes, but not provided with time directivity, and mostly irrelevant to training; when mind wandering time directs to now and future, mind wandering is relevant to recent life. The difference between the total frequency of mind wandering during a com-plicated task and the total frequency of mind wandering during a simple task is not statistically significant; the fre-quency of mind wandering without meta-awareness during a complicated task is significantly greater than the fre-quency of mind wandering without meta-awareness during a simple task. The said findings indicate the followings: athlete mind wandering is characterized with collectivity; the more complicated the task, the less the athlete knows that he/she is mind wandering.